Movies: MPEG, QuickTime, Animated GIF. Explanatory note: In this and all subsequent coronagraph images, the shaded disk is a mask in the instrument that blots out direct sunlight. The white circle added within the disk shows the size and position of the visible Sun. Caption: Calculations confirm that a comet spotted by Kazimieris Cernis of Vilnius, Lithuania, on 4 February is a previously unknown object, making it the 100th comet discovered with the SOHO spacecraft. Launched four years ago as a project of international cooperation between the European Space Agency and NASA, the Solar and Heliospheric Observatory has revolutionized the science of the Sun. It has also revealed an amazing number of kamikaze comets plunging into the solar atmosphere, which help to make SOHO the most prolific comet finder in the history of astronomy. But SOHO-100 is an ordinary comet, and so are two others that have appeared in the past few days. Caption:LASCO C2 image of the solar corona on 23 December 1996 at 04:44 UT showing the inner streamer belt along the Sun's equator, where the low latitude solar wind originates and is accelerated. Over the polar regions, one sees the polar plumes all the way out to the edge of the field of view. The field of view of this coronagraph encompasses 8.4 million kilometers (5.25 million miles) of the inner heliosphere. The frame features Comet SOHO-6 with its tail curving towards the lower left side of the image. In a rare celestial spectacle, two comets were observed plunging into the Sun's atmosphere in close succession, on June 1 and 2, 1998. This unusual event on Earth's own star was followed on June 2 by a likely unrelated but also dramatic ejection of solar gas and magnetic fields on the southwest (or lower right) limb of the Sun. Movies: MPEG: C2, C3, QuickTime: C2, C3. This Kreutz sungrazing comet from April 30, 1998 was observed in the LASCO C2 telescope. 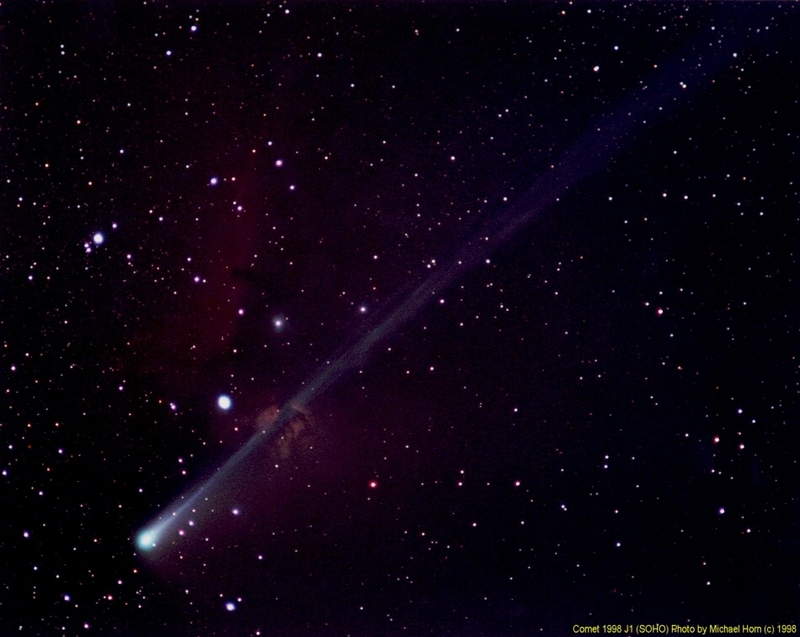 The comet is seen to fade rapidly as it approaches the Sun over a period of just 5 hours. The comet's nucleus is overexposed in the first few frames, resulting in the visible diffraction spikes. *Not necessarily discovered by SOHO. For an exhaustive list of all comets discovered by SOHO, go to the Sungrazer site. Discovered by Yuji Hyakutake in Japan on 30 January 1996, this conspicuous comet passed grandly through LASCO C3's field of view at the beginning of May 1996. Even bright comets are not normally visible so close to the Sun in the sky, without the benefit of the artificial eclipse in a coronagraph such as LASCO. Movies: MPEG: small, full size, QuickTime. This dramatic movie shows comet C/1998 G3 (SOHO-46). This comet, while not a Kreutz sungrazer, approaches to within 7 solar radii (4.5 million kilometers) of the Sun. The comet is seen to `whip' around the Sun and then fade from view. 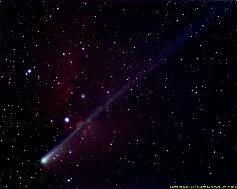 This comet fades not because it has burned up, but because it is receding from the Sun. Note, at the beginning of the sequence, a faint Kreutz sungrazer (SOHO-47) can be seen, quickly moving towards the Sun from the bottom of the picture. It takes sharp eyes to find the Kreutz comet, as there is no visible tail.